Republic of Korean Ministry of Culture, Sports and Tourism presented the first ever Concept Korea Spring 2011 Fashion Collective at Mercedes-Benz Fashion Week. 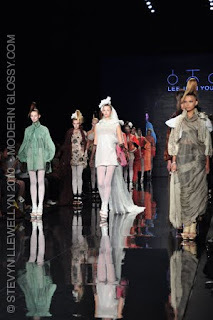 Concept Korea Interactive Waves 2011 featured three Korean designers - Kwak Hyun Joo, Ju Young Lee and Lee Jean Youn. PUCCA by Kwak Hyan Joo includes bright colors and flouncy mini skirts and collaborated with the world famous character 'Pucca'. RESURRECTION by Juyoung is functional and edgy with studded details and pockets. The palette is dominated by black, along with grey, khaki and beige, while incorporating cupra, leather, wool, silk and cotton. Lee Jean Youn's collection titled "The Strange Wedding Ceremony" tells the story of love, life and death. Black, gray, leather pants and organza dresses change to a white sequin dresses with white veils. I liked how the models took their runway walk and then stayed in place until they all filled the runway.